If we don't want small Indian wineries to disappear, it's worth supporting them by buying and drinking their wines, says Alok Chandra. 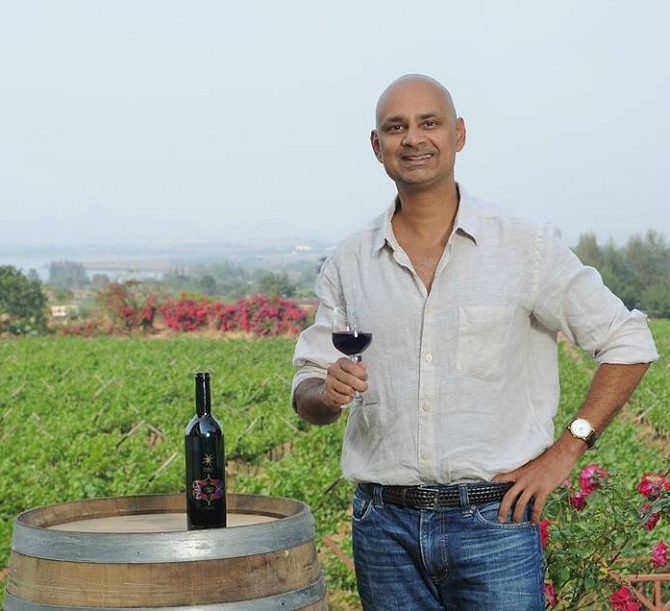 IMAGE: Sula Wines's Rajeev Samant. On an average, I get five calls a week from sundry folks looking to enter the wine market in India. 'A friend/business acquaintance in France/Australia knows this winery owner -- how can I import wine into India?' Or the person wants to start a winery or make wine. If the person at the other end is still talking to me, then it's a serious inquiry, and we take things further -- which happens perhaps once in 10 occasions. Sula Vineyards: The market leader in India, Sula is the only winery making any money -- and not a great amount at that: in 2015-16, its total revenue was ₹336 crore, on which Sula had a PBDT of ₹44 crore (13 per cent) and a PAT of ₹21 crore (6.25 per cent). Revenue growth was 22 per cent, but PAT grew just 14 per cent, with growth and capex funded by bringing in a new investor (Ravi Vishwanathan), who now owns nearly 30 per cent of the company. Fratelli Wines: This is the only other Indian wine company in the black. It declared a PAT of ₹1 lakh on a revenue of ₹45 crore in 2015-16, growing 54 per cent in rupee terms. It, too, has been raising funds by issuing shares and borrowings, but has a healthy balance sheet and has lately also started distributing imported wines. Grover Zampa Vineyards: Narrowly the second-largest Indian wine company, it had a revenue of ₹56 crore, a PBDT of ₹12.5 crore and a PAT of ₹14 crore. It has been in the red for at least the past 3 years, has completely eroded its shareholder's funds (now ₹5 crore), and has stayed solvent entirely due to selling shares: Ravi Vishwanathan now owns some 30 per cent of the company. Four Seasons Wines: A subsidiary of United Spirits (now owned by Diageo), it has also had a negative PAT for at least the past 3 years: it was ₹26.6 crore on a revenue of ₹21.3 crore in 15-16, essentially because of very high sales and marketing expenses. However, the parent company has yet to let it go under, even though shareholder's funds at ₹37 crore have been completely eroded. Maybe there's a game plan here, somewhere. Charosa Wineries: This is a really bad story. FY 15-16 saw revenue of just ₹3 crore and losses of ₹18 crore, with shareholder's funds standing at ₹63 crore. Parent HCC has apparently been looking in vain for a buyer for some time, which it won't find unless the debt burden of ₹116 Crore is dealt with. And what of other Indian wineries? Probably more of the same for most, with perhaps a few exceptions: York probably has its head above water, as perhaps does Soma (Nashik); Reveilo, Vallonne and other Maharashtra-based wineries continue to struggle, while wineries in Karnataka (Krsma, SDU, Nandi Valley, Rico and Elite) seem to be doing okay in sales, the bottom line is probably another matter. If we don't want small Indian wineries to disappear, it's worth supporting them by buying and drinking their wines -- even if it means taking the trouble to source their relatively unknown labels. Alok Chandra is a Bengaluru-based wine consultant. Which are India's best wines? Have you tasted this Indian whiskey? Met a Wine Geek, Wine Bore, Wine Snob?